Want MDSD @ your event? Contact us Today! Welcome to the web home of the Mountain Dulcimer Society of Dayton, located in the Dayton, Ohio area. 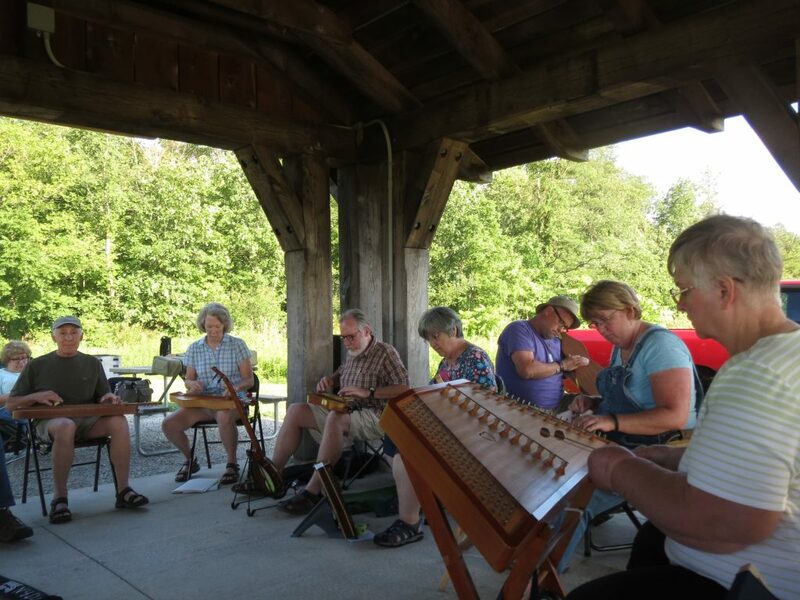 The Society has taken the traditional music of the mountain dulcimer, hammered dulcimer, autoharp, guitar and other acoustic instruments to all types of events in the Dayton area since the mid 1970s. The Club’s monthly jam/meeting will begin with early sessions for beginners and past beginners at 5:30; the new Intermediate jam at 6 pm, with a focus on building skills and familiarity with the club music, a fellowship break and refreshments at 6:30 pm with the general jam starting at 7:00 pm. With all these levels of sharing and instruction, players of any level will find their place, at the Mountain Dulcimer Society of Dayton. If you are interested in learning to play the mountain dulcimer, autoharp or the hammered dulcimer, email our club email address and we’ll set up a class before club meetings and we’ll get you strumming and fretting on popular jam tunes. Our goal is to have you playing in the Club jam and joining us in taking our music to our local community. We also hope you’ll want more information on the MDSD-sponsored dulcimer retreat, Dulcimer Doin’s, in February of each year. Info and registration materials can be found here as well. Through our annual club dues of $20, we sponsor workshops and concerts for our members and the public, provide the Core Tune Book with companion CDs, More Tunes Book (with CD option); workshops, concerts, monthly jams, and a newsletter with MDSD news and dulcimer-related articles each month. Come back often for news and updates. Thank you for wanting to learn more about this great organization, the Mountain Dulcimer Society of Dayton.